← No space for toys? Rent them! We are 11 days away from meeting Teapot, and it’s starting to feel like Noah’s Ark around here – 2 kids, 2 kid beds, 2 of everything (actually, it’s not that bad, but you get the idea). One thing that we also have is 2 cars since the subway conveniently stops at the doorstep of our town. I have a Subaru Forester to do all my mom stuff in, and my husband has a Mini Cooper S since he spends most of his time in and out of the city. I should mention here that my husband LOVES his Mini – it’s his first brand-new-off-the-lot-car and he’s kind of a “car-guy” so loves the sporty handling and the “zippy-ness” as Peep says. The two of them go off on adventures in it all the time. Since I have the bigger car, I’ve never worried about 2 car seats fitting into my back seat. However, the Mini is another question. We have been putting off trying to put 2 car seats into the Mini until now. The fact is, Peep’s booster fits perfectly behind the passenger seat. I’m short (5′) so I don’t mind moving up a little in the front and we can easily go places as a family. My husband is tall (6’2″) so the driver seat is all the way back and is about one inch from the back seat. 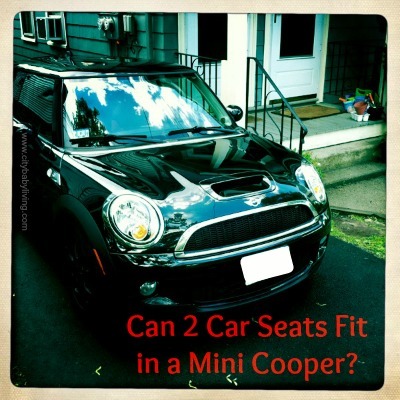 So given this, the question remains…can 2 car seats fit in a Mini Cooper? The answer we found this weekend is – kind of. The infant seat will fit behind the passenger seat if it’s all the way forward, and Peep can fit behind my husband if she puts her feet up a little, and he pulls forward an inch or so. Not ideal for anyone. But…it’s not for forever right? And I’m sure Noah’s Ark got a bit tight in the large animal section right?